OIL Search oil production in the fourth quarter of 2012 was 1.79 million barrels of oil equivalent (mmboe), taking production for the 2012 full year to 6.38 mmboe, according to the company’s December quarterly report released yesterday. This, according to managing director Peter Botten, was within the company’s guidance range. 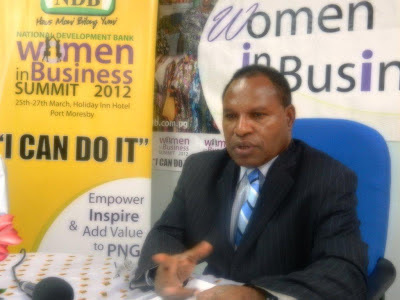 “In the fourth quarter, we experienced a return to normal operating conditions for our PNG producing oil fields following the unplanned shut-in during the third quarter,” he said. “Total oil and gas production for the quarter was 1.79 mmboe, which brought total production for the full year to 6.38 mmboe, consistent with our guidance range. “1.66 million barrels of oil was sold during the quarter, at an average oil price of US$111.09 per barrel. “The crude oil inventory position increased by 81,000 barrels compared to the 2011 year end position. OIL Search finished the 2012 calendar year on a high note, with revenues for the 2012 full year of US$724.6 million (K1.52 billion) and US$218.2 million (K457 million) for the fourth quarter, according to its December quarterly report released yesterday. The company’s financial results for the year to Dec 31, 2012 will be released to the market on Feb 26, 2013. Managing director Peter Botten said the fourth quarter featured a strong production performance from its core PNG oil fields and good progress made on the PNG LNG project and other growth opportunities, including gas expansion and material oil exploration. At the end of last year, the PNG LNG project was about 70% complete and on track for first LNG sales in 2014. The estimated project cost has increased to US$19 billion while the plant capacity has risen to 6.9 million metric tonnes per annum. “For the PNG LNG project, a number of major pieces of project infrastructure are now at, or nearing, completion, with the remainder of works progressing generally in line with schedule,” Botten said. “Importantly, runway pavement at the Komo airfield is progressing well and first cargo flights, which will bring in key items of equipment for the construction of the Hides Gas Conditioning Plant (HGCP), are planned to commence this year. “Oil Search’s associated gas and PRL 2 life extension projects are also advancing and remain on track to supply commissioning gas to the LNG plant this year. “The operator, Esso Highlands Ltd, has reconfirmed the project remains on schedule for first LNG sales in 2014. “Following a cost and schedule review by the operator in November, the capital cost estimate for the project has increased from US$15.7 billion to US$19 billion. “While this is disappointing, the economic impact is largely offset by a 5% increase in LNG plant capacity and considerably higher oil prices than when the project was initially sanctioned. The PRL 3 JV has begun development studies to assess potential design concepts for the P’nyang gas field, which may include a third PNG LNG train. “Oil Search continues to develop its options for LNG growth,” Botten said. A farm-down of Oil Search’s Gulf of Papua acreage to TOTAL S A was executed and documentation submitted for PNG government approval. Botten said this satisfied one of the company’s core strategic objectives, which was to bring an experienced LNG operator into the licences, to share risks during the exploration phase. “Assessment of the new 3D seismic data in the Gulf licences has been encouraging and planning for the offshore drilling programme, beginning in the first-second quarter of this year, is well advanced,” he said. The Archbishop of Port Moresby says Papua New Guinea's government will be slow to activate its death penalty laws because of church opposition. The Archbishop of Port Moresby says Papua New Guinea's government will be slow to activate its death penalty laws because of church opposition, after the Pacific nation's attorney-general said he is revisiting the idea. Archbishop John Ribat says Attorney-General Kerenga Kua's plan to activate the never-before-used law is the wrong way to deter crime and may encourage payback as families seek revenge for an execution. "The payback system can escalate. Killing will give rise to more killing," he said. "If the church really is against it, the government will be really slow to promote this. The government has respect for the church." PNG is home to almost two million Catholics, who comprise 27 per cent of the population. The death penalty is part of PNG's criminal code but the sentence has never been carried out. "The reason it didn't move forward to implementation is we did not have the methodology," Attorney-General Kerenga Kua told AAP. "The mechanism has not been prescribed ... coupled with the political will not being there. "But it is there now." He says there are currently 10 convicted criminals who have been sentenced to death. Mr Kua says crimes such as piracy, aggravated murder and treason should attract the sentence. "A very narrow band of crimes allow for the death penalty but it only applies in the most aggravated circumstance of wilful murder," he said. "Then you have piracy, which is growing in the country. "We need to stamp it out." National Capital District governor and human rights lawyer Powes Parkop also opposes the plan. "It is an inhuman form of punishment and therefore should be unconstitutional," he told The National newspaper last week. "There is no empirical evidence to show that such punishment has been a deterrence to crime generally or the type of crime for which it is prescribed as a penalty." He says in the United States, where some states have the death penalty, there is no evidence to show it has reduced crime. The last death sentence carried out in PNG - by hanging - was during Australian colonial rule in 1954. 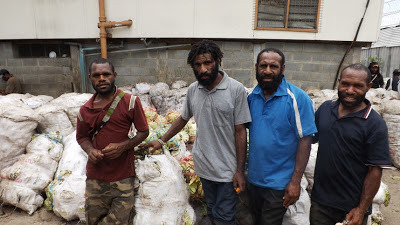 On Tuesday last week, January 15, I met my good mate, Goroka farmer Tom Solepa, who had just completed selling 156 bags of kaukau (sweet potatoes) at Gordon Market in Port Moresby for K150 each. Through him, last Friday, January 18, at Gordon Market, I was able to meet some of the growers and traders involved in the intricate kaukau trade which starts in the Highlands, comes down to the port city of Lae, and is then shipped to Port Moresby. Solepa, a graduate economist who gave up a well-paying government job some years ago to return to the land, will use the more than K7, 000 he earned in just two days to pay school fees for his two children who are attending Goroka International Primary School. 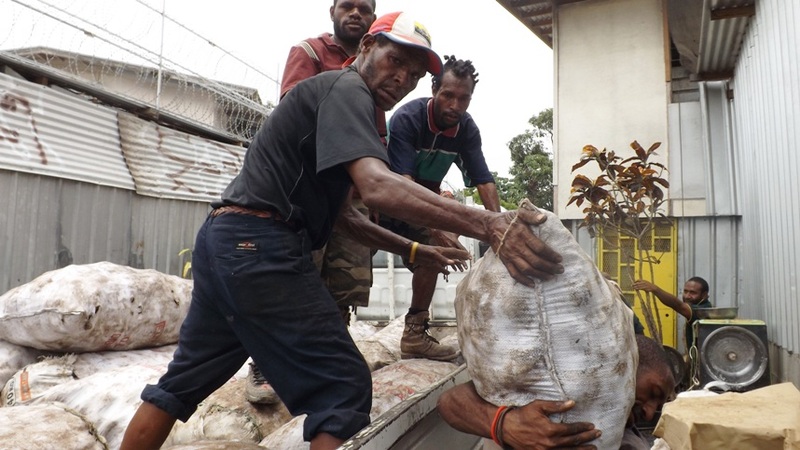 He was very proud, as an executive of Highlands Farmers and Settlers Association (HFSA), to have brought his kaukau all the way from Goroka via Lae to Port Moresby. “It takes courage, patience, to bring our kaukau to market,” Solepa says. “As a person who has been trying to promote farmer issues, this gives me a lot of satisfaction. “I want to tell our people that money is on the land. Solepa, 38, from Meteyufa village outside Goroka in the Asaro Valley, says kaukau is a “winner”. “I see the kaukau trade as a big business,” he explains. “You bring in kaukau from rural areas to urban areas. “In Goroka, we do sell the kaukau we grow; however, we feel that we can make better money if we sell in Lae or Port Moresby. “We stopped growing coffee a long time ago. “It takes us just three months to for kaukau, from growing to harvesting. “In a year, we make four harvests. The process, however, can be expensive, as Solepa has had to pay people to tend his gardens, harvest and bag the kaukau, carry them to roadside, road transport to Lae, sea transport to Port Moresby, and several others. He has also had to pay for his airfares to and from Goroka. But true to form, Solepa reaped what he sowed, and what he had earned from this latest kaukau sale will go towards the education of his two children at international school in Goroka. “My kids are at international school so this money is for their school fees,” he said. 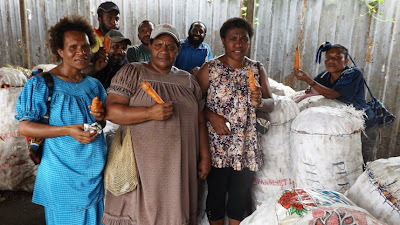 Last Friday, Solepa took me to a house opposite Gordon Market, owned by an Eastern Highlands family, which is used as a storage facility for growers from Goroka to sell their kaukau and vegetables in bulk. Bags of kaukau and vegetables from Eastern Highlands province being stored open-air next to Gordon Market because of lack of proper storage facilities for growers. Woman trader, Masam Kulo, lives in Port Moresby and sells kaukau that her brother sends in from Goroka. “When there is plenty of kaukau, we sell a bag for K120 or K130, but when there is a shortage, we sell for K150, K160, or K170,” she says. 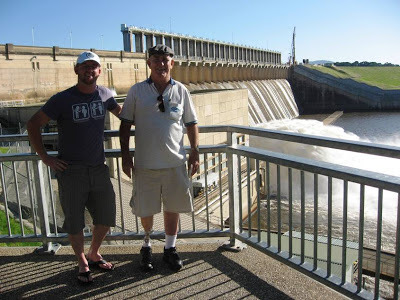 “Our customers are from the smaller markets around Port Moresby, who buy in bulk from us and resell. “When there is an oversupply, we make a loss. Another woman trader, Rose Goiya, is blunt in her criticism of government for lack of support by way of freight subsidies and vegetable storage facilities. “Farmers are the backbone of the nation but we get no support from the government,” she says. “They give support to other industries but not this. “There should be proper storage facilities and assistance with transportation in place. “The department of Agriculture and Livestock doesn’t support us in any way. Apart from the kaukau growers and traders, there are also those involved in vegetables. Janet Mose buys bags of cabbages from farmers in Eastern Highlands and transports them at her own cost to Port Moresby, where she sells the cabbages wholesale to Port Moresby buyers. Janet Mose with her bags of cabbages. 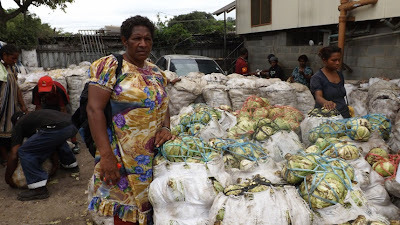 “I buy my cabbages from farmers in Goroka and I pay for the cost of bringing it over to Port Moresby,” she says. “I pay K50 for a bag of cabbages in Goroka and sell it here in Port Moresby for K150 a bag. Patricia Koike, from Iufi Iufa village in the Asaro Valley, grows her own carrots and brings them over to Port Moresby for sale. Patricia Koike (second from right) with her bags of carrots. 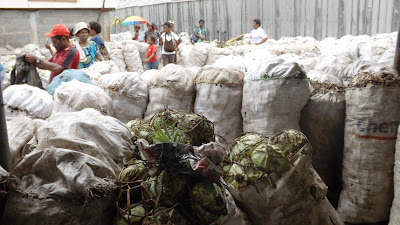 “There is no storage area so our produce can be ruined by sun or rain,” she says. Pisin Benjamin, whose family lives in the house used by Eastern Highlanders as a storage area, says it was established by his late father Benjamin Tehe to help growers from their province. Pisin Benjamin (second from left) and other family members at their house in Gordon which is used by Eastern Highlanders as a kaukau and vegetable storage area. In fact, it started off quite well and even had a cold storage facility, which has eventually broken down. “My father established this facility to help the farmers of Eastern Highlands,” he says. “This has become a wholesale vegetable shop for Eastern Highlanders. “In 2007, we made a proposal to the Department of Agriculture and Livestock to set up a cold storage facility, however, this was not enough as there were too many vegetables coming in. “We charge K3 per bag to store in our yard from arrival to sale. “We have 300-400 bags of vegetables coming in a week, and 400-500 bags of kaukau. Papua New Guinea's attorney-general says he wants to reactivate the death penalty for aggravated crimes such as treason, murder and piracy. He says there are 10 convicted criminals on death row. The last death sentence carried out in PNG was during Australian colonial rule in 1954. "A very narrow band of crimes allow for the death penalty, but it only applies in the most aggravated circumstance of wilful murder," he said. National Capital District governor and human rights lawyer Powes Parkop opposes the plan. He said in the United States, where some states have the death penalty, there is no evidence to show it has reduced crime. The Catholic church of PNG has also voiced its opposition to the death penalty, with General Secretary Father Victor Roach warning it could prolong the practice of payback among tribes. Minister for Trade Commerce and Industry, Richard Maru has announced that payment of business development grants (BDGs) allocated to Angore PDL (petroleum development license) 8 area in Hela will be delayed indefinitely. Maru made this declaration in light of unresolved landowner disputes within Angore PDL 8 regarding distribution of the BDGs, and the existence of a court order restraining his department and the state from disbursing the funds. Maru said he intended to review the past BDG payments made to other PDL areas that were part of the PNG LNG project to ascertain how these earlier payments were utilised and whether or not the groups that received these payments had existing business with the developer Exxon Mobil. He said this was crucial to ascertain the relationship between the BDGs and tangible developments on the ground brought about by landowner participation in spin-offs from the PNG LNG project. “I want to put on notice landowner companies who have received BDGs that my department will be doing a review to see what businesses have been started using BDGs paid out in the past” Maru said. He said that BDGs were public funds and those entrusted with these funds must give an account of the use of these funds and what spinoff businesses were started with the support of Exxon Mobil. He added that these funds are not for landowner company directors and management to spend on pokies, but to secure long term benefits for landowner beneficiaries including their future generations. “One day the gas will be all gone and the people will be left with nothing if we don’t invest prudently for them today,” Maru said. Well-known Papua New Guinea rugby league administrator, Kevin Murphy, died of a massive heart attack in Orange, New South Wales, last Friday at age 63. Murphy, who is known the length and breadth of this country for his passion for the “greatest game of all”, passed away at 7am in the home of an elder brother, Brian, who is a Catholic priest. Murphy, a kiap (patrol officer) in the late 1960s who later moved into education, commerce and became president of the PNG Rugby Football League, reluctantly moved to Australia in 2008 because of diabetes and had his right leg amputated. His first emergence from hospital was to attend a barbecue for his beloved PNG Kumuls, who had travelled to play a Cairns team, and till the day he died Murphy was always passionate about rugby league in PNG. Murphy’s wife, Wendy, whom he married in 1972, died of cancer while he was recovering and he could not return to the land he called “home” and loved so much. “For the last four years, he has lived in Tamworth,” Murphy’s second son, Daniel, told The National. “He was always torn between two cultures: the PNG culture and the Australian culture. “He always carried a bilum everywhere. “He passed away in Orange on Friday morning, at about 7am, at the place of his brother, Brian Murphy, who is a Catholic priest. “His last job was at Niugini Oil in Mt Hagen, but due to his health, he could not work again. “He did some voluntary work at a youth centre here in Tamworth. Murphy, of Irish origin, was born on May 10, 1949, came to PNG as a fresh-faced 18-year-old in 1967, and stayed here for the next 42 years. 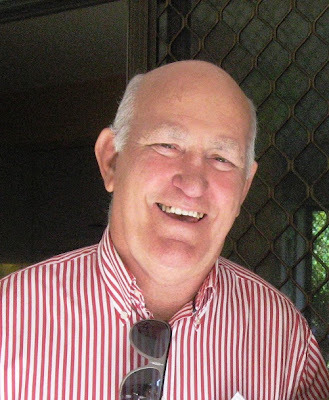 After his stint as a kiap, Murphy was a primary school teacher in remote Henganofi and Kainantu areas of Eastern Highlands, Department of Provincial Affairs, National Sports Institute in Goroka as rugby league administrator, Rothmans, and Niugini Oil. Kevin Murphy in his role as a counselor for Transparency International before the 2007 national elections. He is survived by his three sons Adrian (39), Daniel (36), and Anthony (33). Murphy is the last of five brothers – Patrick, John, Brian, Bill, and himself – and is the first to die. His remains will be cremated and his funeral services held at St Joseph’s Catholic, Orange, NSW, at 2pm on Friday. Can PNG convert growth into development?